Fluidic designs, manufactures and markets precision metering mix and dispensing and spray systems. Fluidic systems are available for meter, mix and dispense single, two, three or four or more component material formulations for manual and robotic, spray or dispense applications. The MMD equipment can process a variety of 2, 3 or more plural component resins such as epoxies, urethane, polyurethane, silicones, polysulfides, acrylics, polyesters, and other thermosets. Founded in 2000 and headquartered in Orange County, CA, Fluidic serves a wide variety of markets, including general industrial, electrical and electronic, automotive, and military/aerospace industries for a number of applications such as paint, coating, adhesive, sealants, potting, and encapsulation. 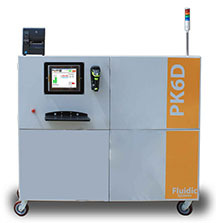 For complex applications where 4 or more components need to be mixed simultaneously or in a given combination, Fluidic can engineer and manufacture custom solutions tailored to your specific application needs. Challenge: Quickly, safely and easily fill 6, 12 and 20 fl-oz cartridges. Challenge: Bubble free, continuous dispense application. Programmable and repeatable flowrate.